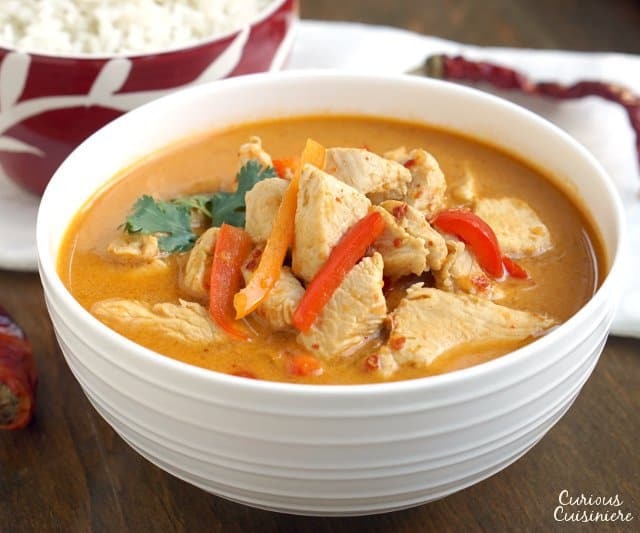 Thai Red Curry is a creamy and flavorful curry that is incredibly versatile and easy to make. 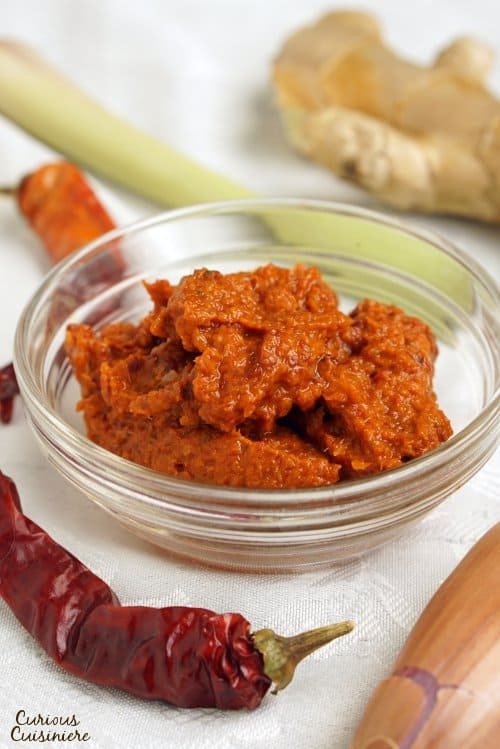 Making your own homemade Thai Red Curry Paste is an easy way to give your curry a wonderful boost of flavor. 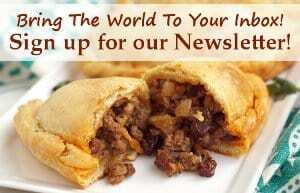 What Is Thai Red Curry? 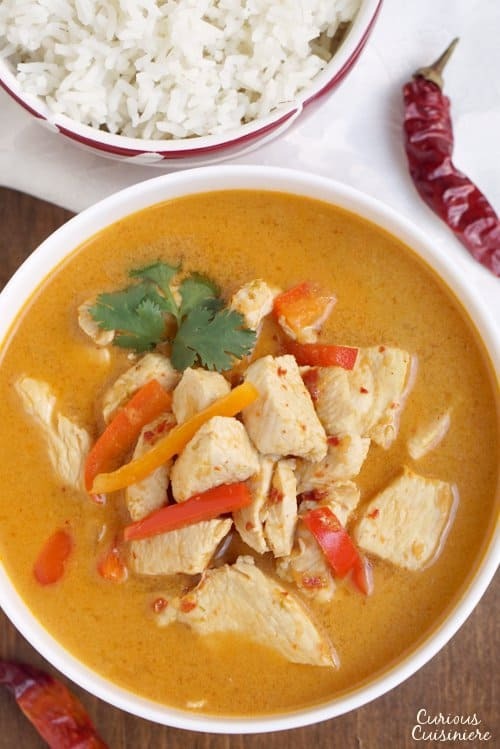 Red curry is one of the most popular Thai curries in the west. It is a medium-spicy soup that gets it’s color and spice from the use of dried red chilies that are made into a red curry paste. This red curry paste is combined with coconut milk to create a wonderfully hued base for the soup that also contains a meat protein (often chicken, pork, or beef) and vegetables (like pumpkin, Thai eggplant, or bamboo shoots). 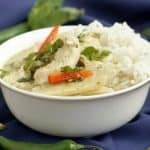 Because of it’s soupy consistency, Thai red curry is typically served with a large helping of white rice, which works nicely to soak up the fragrant, spiced coconut milk. 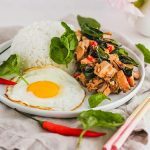 There are MANY chilies that fall into the category of Thai chilies, so it’s understandable that things can get a bit confusing. But, for our purposes, the Thai chilies that are primarily used to make chilies fall in one of two camps. Traditionally, Thai red curry is NOT made with these fiery chilies, rather it is made with dried red spur chilies. Spur chilies (called prik chee fah) are longer chilies (2-5 inches long) that also turn from green to red as they mature. 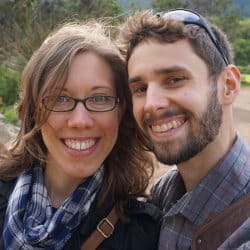 Their name means “pointing to the sky,” after their growing tendency. Prik chee fah weigh in around 5,000-30,000 on the Scoville heat scale, about the same heat as a Serrano chili. They are commonly used fresh as a garnish, but are also often dried when they are red and ripe. They are used in their dried form to make red curry paste. If substituting for the hotter, prik kee noo, chili we would use Tabasco or cayenne chilies for a similar heat level (although slightly lower at 50,000 Scoville units). For the milder prik chee fah chili, serrano chilies make a great substitute. However, depending on where you live, it can be hard to find ripe, red Serranos or dried Serrano chilies. So, for our red curry paste (which needs dried prik chee fah) we use dried guajillo chilies, which come in a little lower on the heat scale (2,500-5,000 Scoville) combined with a pinch of cayenne powder to get the heat right where we want it. 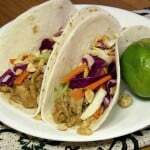 Making Thai red curry paste is incredibly similar to making Thai green curry paste. Many of the ingredients are the same, and we use many of the same substitutions in this recipe that we used in our green curry paste recipe. One difference in the two curry pastes is that red curry paste does not use Thai basil, so it is slightly less herby in flavor. But, the major difference between green and red curry paste is that red curry paste uses dried chilies rather than fresh. The dried red chilies are soaked to soften them before blending, and they give the paste a sweeter, almost rich flavor. 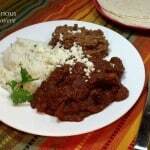 Like we mentioned above, we use guajillo chilies in place of dried Thai red chilies. Guajillo chilies are a bit less spicy than the traditional Thai chilies, so you can either add more to your curry paste or add a pinch of cayenne powder until your curry paste reaches a heat level that you like. 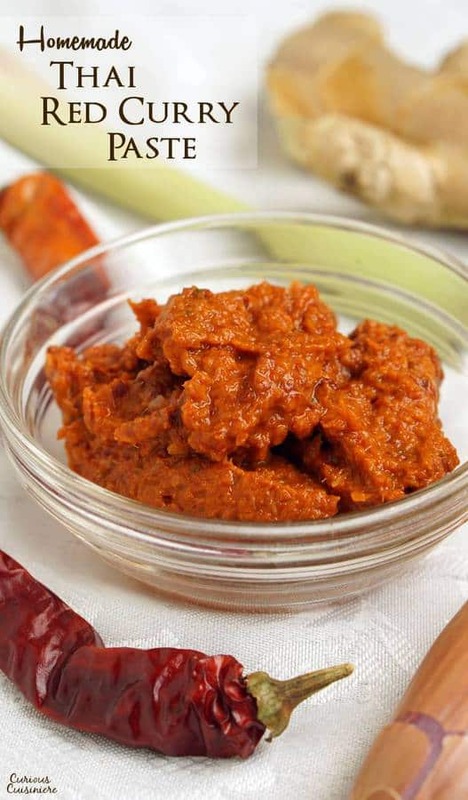 Thai Red Curry Paste is easy to make at home and more flavorful than the store bought version. 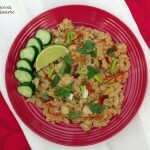 Use it today to make your own Thai Red Curry! Soak the chilies in boiling water to soften. Once they are soft, remove the stems and seeds. Chop the flesh of the peppers and place it in your food processor. Add the garlic, shallots, lemongrass, ginger, lime zest, salt, and vegetable oil. Pulse the food processor to chop the ingredients, continuing until a paste starts to form. Add some of the chili soaking liquid, as necessary, so that a smooth paste comes together. Taste your curry paste and add cayenne powder if desired for a hotter paste. 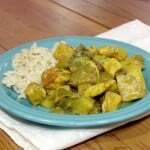 Store curry paste in an air-tight container in the refrigerator for up to 2 weeks. Thai Red Curry is a flavorful meal that can be on your table in less than 30 minutes! 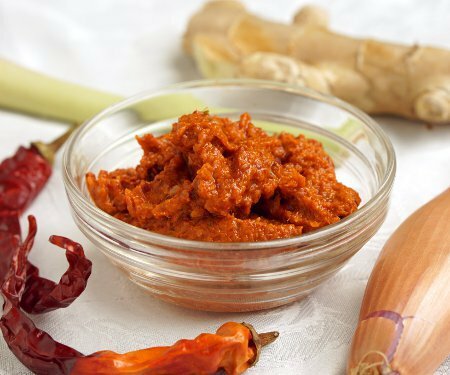 Make it taste even better by making your own homemade Thai Red Curry Paste! In a medium saucepan combine curry paste and coconut milk. Bring the mixture to a simmer over medium high heat. Add the chicken, lime zest, fish sauce, and sugar. 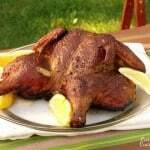 Simmer until the chicken is nearly cooked through, 5-7 minutes. Add the bell peppers and simmer for 2-3 minutes longer. Taste and adjust the salt. 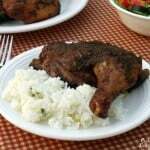 Serve with a generous helping of white rice.